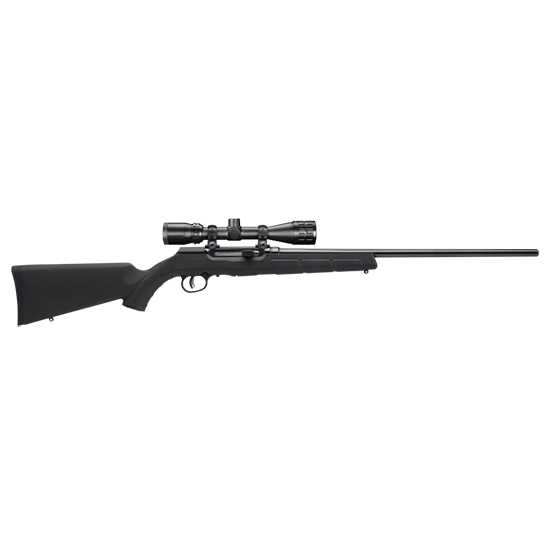 Savage 47011 A17 XP with Scope Semi-Automatic 17 HMR 22 10+1 Synthetic Black Stk Black in. The Savage A17 XP with Scope rifle features a black Case hardened receiver with a hard chrome bolt with oversized bolt handle. It has a black long button rifled. This rifle has a accutrigger and is adjustable from 1.56 pounds with an included adjustment tool. The synthetic stock has textured sections on the grip and forearm for improved handling.This model has a Bushnell 3.510x 36mm scope and a detachable rotary magazine.